Winners Of Luxury Haven’s Hard Rock Hotel Giveaway! You are here:Home » Travel » Winners Of Luxury Haven’s Hard Rock Hotel Giveaway! Are you guys excited? It’s the moment you’ve been waiting for………. 9 winners will get a piece of #HardRock, be it big or small! 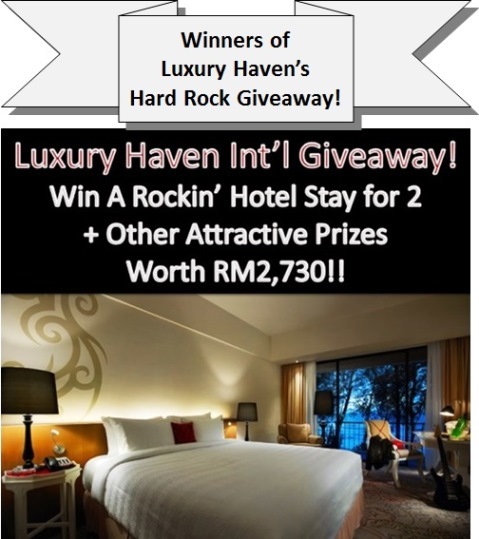 Thank you all for the overwhelming response at Win Hard Rock Hotel Stays + Other Attractive Prizes Worth RM2,730 at Luxury Haven!! For this giveaway, we’ve winners from Australia, Malaysia, Philippines & Singapore, with Malaysians winning the bulk of the prizes!! 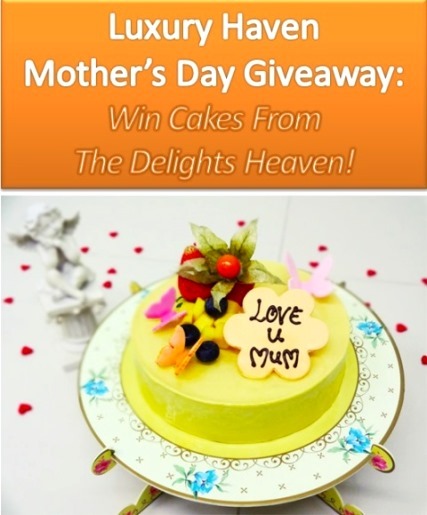 2D1N Rockin’ Hotel Stay for two worth RM1,160 x 2 Winners! Classic Tee Worth RM80 x 2 Winners! Limited Edition Hard Rock Pin Worth RM50 x 5 Winners! Due to the over-whelming response, I’ve decided to throw in a Bonus Draw. I really hate seeing so many of my readers leaving Luxury Haven empty handed. Hence, I’ll give away my set of Hard Rock Classic Tee Worth RM80 & Hard Rock Pin Worth RM50 to 2 additional winners. Don’t worry, they’re brand new in their original packaging from #hardrock! * Sue Fang, kindly email me to arrange to pick up your prize. PH Ng, pls email me your address & I'll send you the pin. After posting your comments below, please follow up with an email to blackswanst@hotmail.com with your delivery address for Hard Rock to send out the prizes. For the hotel vouchers, validity of redemption is from May – Oct 2013. Thank you again Hard Rock, for sponsoring this rocking Giveaway! Name not in the winning list? Get over to Mother’s Day Giveaway: Win Cakes From The Delights Heaven to try your luck again! This is an awesome surprise. I can't believe it that I have won the 2D/1N stay at Hard Rock! Tell me it is true, Shirley! Thanks Shirley, I cant believe Im one of the wiiners here!Thanks again and will surely send an email! Wow! Im one of the lucky winners here!Thanks Shirley and will email you in awhile!Thanks! Thanks Shirley for the tag in fb... will email you in a few seconds.... cheers! Thanks for the giveaway! Thanks Shirley for letting me know that I'm one of the very lucky winners. As you have suggested, I did call on "May the 4th..." to bless my entry . Kylie, thks so much for linking up!